Sue's Blog - Some assembly required. : Funny that. I read an interesting fact on facebook the other day. 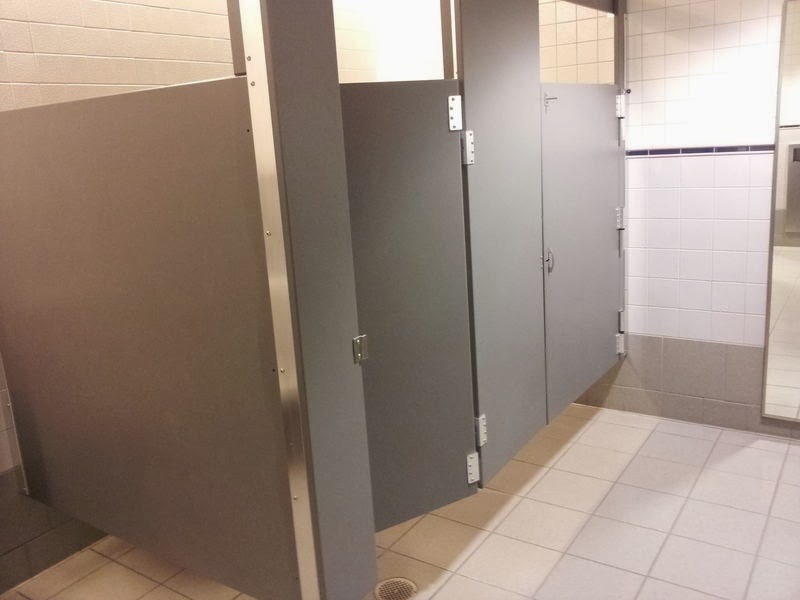 Most people who come to the USA for the first time are most surprised by the gaps down the doors in public toilets....or restrooms as they are delicately called over here. I remember being shocked by them too. Donna gets really angry about it. The gaps are about an inch wide (or two) on both sides of the door. Also, the walls and door are really high above floor level. This is sometimes so high it barely shields the toilet bowl. I have to admit it is very disconcerting to be 'using the facilities' and at the same time be able to watch all the comings and goings in the loo. Glenn made a comment once about being able to just hand someone a toilet roll, if theirs had run out, by just passing it across. You would barely have to lean down. I always know I am back in England when I can comfortably visit the 'ablutions hut' without fear of being on public display. I suppose we Brits are all a bit fussy with toilets. I know I am. I do love a spotlessly clean toilet. They are clean here actually....just a bit 'open to the world'. My mother always used to pride herself on the condition of our toilet. "Cleaner than any hospital toilet" she would announce. I don't know about that though. I have seen some pretty grotty hospital toilets. We are hoping to have a new bathroom installed this year. It will depend on the estimates of course, but I hope we can. It will be the downstairs bathroom, the one visitors use (I am the only one who generally uses the upstairs one). I do hope we can do it. It would be lovely to have a new loo that doesn't have to be flushed 2 or 3 times (I have trained the chaps currently in this household to perform this manoeuvre now) to ensure nothing lingers. Funny how bliss can be a sparkling new bog, but these things matter...........to me anyway. How did I write a blog about toilets? I am sure I didn't mean to, it just sort of happened.